Thank you for a wonderful blog! 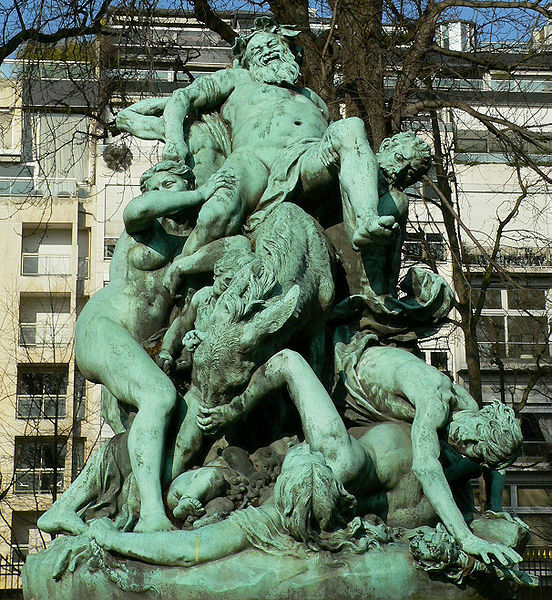 Dalou's statue, Le Triomphe de Silène, is indeed remarkable and powerful. I’ve seen it a few times in the "Lux" while in Paris. In the quote: I think the word “enchevelrement” is enchevêtrement (entangled). Also, is it Nourrisise, or nourrices ? I couldn’t find the original. Some further thoughts: Originally a group, the Silenoi were followers of Dionysus. They were bald, fat, thick lipped drunks with squat noses, and the legs of a human. Later, the plural "silenoi" went out of use and the only references were to one individual named Silenus, the teacher and faithful companion of the wine-god Dionysus. A notorious wine consumer, usually drunk, and had to be supported by satyrs. Silenus was described as the oldest, wisest (and most drunken) of the followers of Dionysus, and in Orphic hymns was the young god's tutor. When intoxicated, Silenus supposedly had special knowledge and the power of prophecy. In the Greek mythology, Silène is the son of Hermès or Pan, but his genealogy is very confused and varies according to the sources. He is a satyr, half-human, half-beast, a wild man living in woods who goes out only to get drunk and attend to the education of Dionysos. Trusted by the nymphs and children only because he was attributed a great wisdom. Some think Silène/Silenus embodies the fertility of the earth and men, and holds the secret of wine (the spirit). I think Carl Jung felt that the Dionysian cult was a reflection of the two-sided nature of man, in need of connection to the earth without being disembodied of the spirit. Sadly, Dalou’s working class sympathies diminished his career and resulted in being denied the Prix de Rome, more than once. I think an interesting aside, is that in 1871, Dalou was exiled to England where he remained for 8 years due to for his association with the Paris Commune. While there, he was convicted in France and given the sentence of life imprisonment. Fortunately, the amnesty recinded that sentence when he returned in 1879. Some feel his creating the Le Triomphe de Silène expressed his disdain for the government of Napolean III, the sham French artistocracy/ plutocracy (ploutocratie) that crushed the common man, including, of course, Dalou.